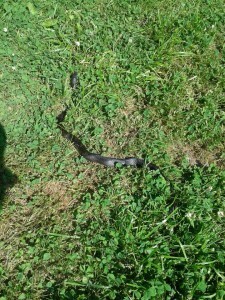 UPDATE: A black rat snake was spotted on our preserve grounds on May 23, 2012, and was noted as being several feet long. 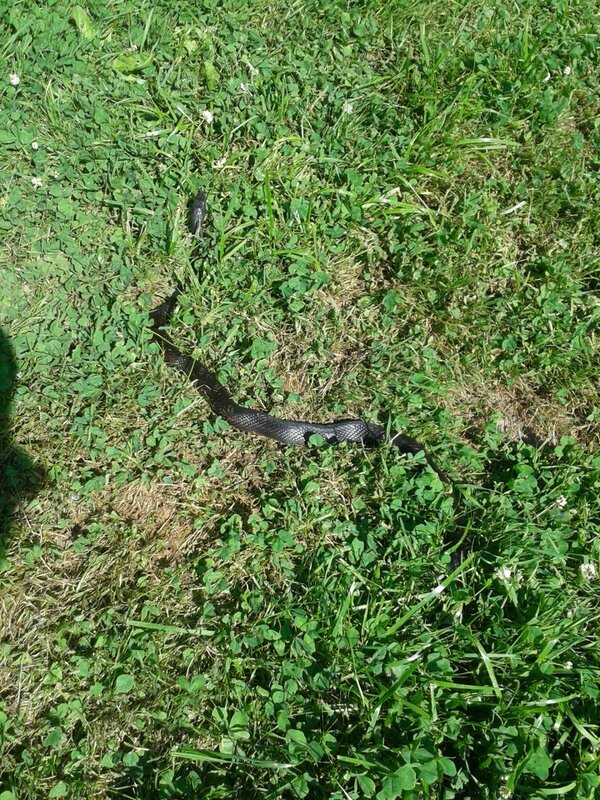 We have spotted snake skins at least 8 feet long on the property. They are our largest Ohio native snake and an important part of the ecosystem, helping to control mice and will also eat frogs and birds. They are generally laid-back and will not attack. The black rat snake at the Historic Shupe Homestead Wildlife Preserve in Amherst. Our wildlife conservancy at the 1816 Historic Shupe Homestead along Beaver Creek here in Amherst, Ohio is home to many kinds of wildlife. This Spring we have noted two important bird sightings/events. A Red-tailed Hawk family has made its nest in a large Pin Oak tree in our woods, and an American Bald Eagle was observed resting on a large White Oak branch over the Beaver Creek. These are two significant sightings, among many others that we have documented here at the property. 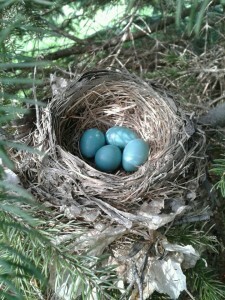 The Eastern Bluebirds are again nesting on the property, along with a Mourning Dove who has once again chosen a porch light fixture as her nest site. 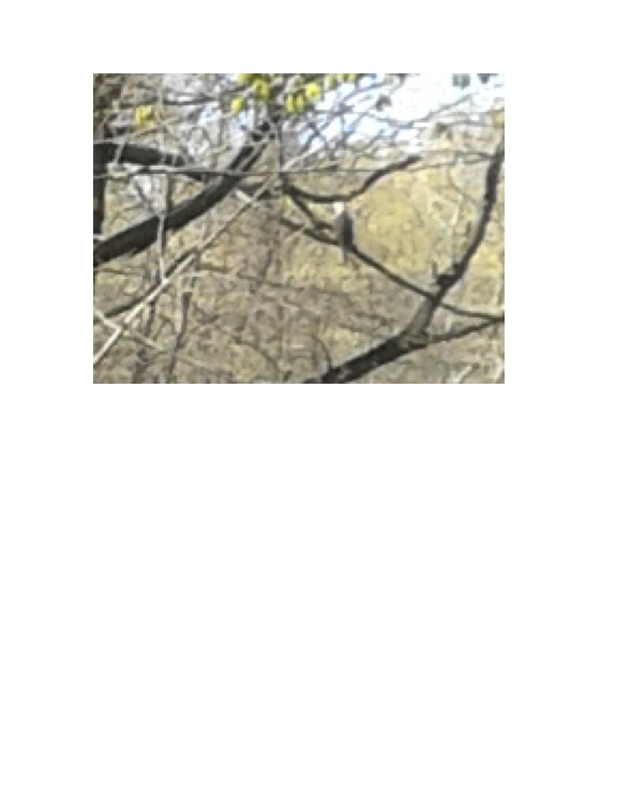 An enhanced photo of a Bald Eagle looking over Beaver Creek. 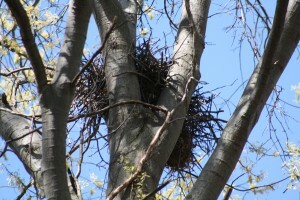 Red-tailed Hawk nest in the Preserve woods. American Robin nest about waist-high in a pine tree located in a field habitat at the wildlife conservancy.